Providing professional wedding and event videography and photography to Hertfordshire and surrounding counties. 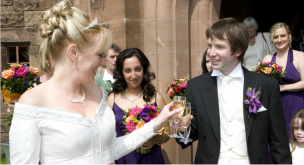 AK have over 20 years experience of filming weddings and have detailed knowledge of many churches and civil ceremony venues across NW London and the surrounding counties which is crucial for obtaining the best possible video recording. Filming is always very discrete and utilizes professional high definition cameras and radio microphones. AK wedding photography service focuses on providing the maximum number of quality prints of the bridal party both in group poses and informally during the whole of the wedding day. In order to produce these in an affordable package we do not include an album as standard although we are very happy to provide one separately if requested.